The Ryedale Festival takes place in and around Ryedale in North Yorkshire, this year from 12 to 28 July 2013. This year's festival opera was Mozart's The Magic Flute. Nina Brazier's production debuted in July at Ampleforth College Theatre before coming to London as part of this year's Grimeborn Festival at the Arcola Theatre in Dalston. I caught the first night on 7 August 2013. 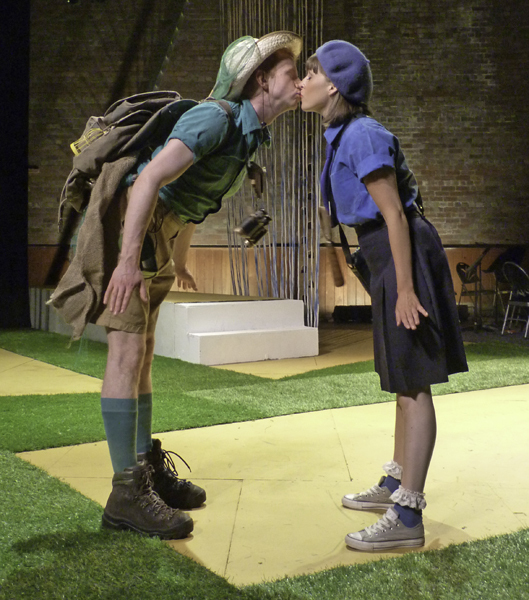 The young cast included Ben Thapa Luke D Williams Helen Bailey, Anna Rajah David Hansford and Adam Player. Christopher Glynn, Artistic Director of the Ryedale Festival, conducted an ensemble made up of the Quintessence Wind Ensemble and the Eka Quartet. I have to confess that this was my first visit to the Arcola Theatre which inhabits the old Reeves (Artists Colourmen) paint factory. The main theatre is a large rectangular box-like space with two banks of seats facing each other at either end of the room with the playing area in the middle. Running along one side is a small seating balcony and under this were placed conductor Christopher Glynn and the ensemble, giving Christopher Glynn an excellent view of the cast despite the open nature of the playing area. Giulia Scrimieri's simple but effective abstract permanent set consisted of some rope hangings, a projecting catwalk and a chaise longue. Costumes were loosely contemporary and Brazier and Scrimieri seem to have been content to tell the story as clearly and straight forwardly as possible. Budget was clearly low but it was a shame that the costumes were not of a better cut and fit, and certainly Ben Thapa should not have made his first entry in a shirt that hardly fitted him. The arrangement of the music was uncredited. The ensemble of 11 (string quartet, double bass, wind quintet and celeste) seemed to be using the standard string parts (with slight additions) plus newly crafted wind parts. The results were highly effective. Though we lost some of the majesty of the bigger moments and there were some unconvincing corners, we were rewarded with some very fine string and wind playing. Glynn accorded his players the compliment of not conducting in some of the instrumental passages. Ben Thapa has understudied the role of Tamino at Garsington. Once past his rather unconvincing struggles with a rope snake he made a noble Tamino, rather serious and intense but full of rumpled charm. His lyric voice is on the big side and I think he would have benefited from a more sympathetic, less dry acoustic, but he accorded the music a great sense of line and shape. Helen Bailey was an attractive Pamina, according the music a lovely flexible line and producing some radiant tone in her solos. She was an intensely serious Pamina and brought out in act two her depth of feeling for Tamino, particularly in her final aria. David Hansford was a remarkably young looking Sarastro, but he certainly had all the notes and displayed a beautifully focussed and darkly expressive lower register (I last saw him as Seneca in the Royal College of Music's L'Incoronazione di Poppea, see my review). Higher up the voice was inclined to dryness but a more sympathetic acoustic might have helped. Hansford was noble and dignified, but his performance was in danger of becoming a little stiff and I think that Brazier should have done more to humanise him. It didn't help that his velvet jacket and cravat made him look like a character from a 1970's TV series. His opposite number, the Queen of the Night, was played to full glamour by Anna Rajah complete with a shiny gold dress. Luckily she had the technique to match and gave full value to the coloratura in both of her arias. In act two she was rather softer edged in character than some productions, but this fitted in with the very human scale of the production. Papageno was portrayed more as a scout master than half-bird but Luke D. Williams created him as an appealingly crazy and rather dyspraxic sort of character with a lot of physical comedy, he was very much a cheekie chappie. Williams also has great charm on stage (he sang the title role in the London Handel Festival's Imeneo, see my review) and had the knack of being able to seem as if he was addressing the audience directly. Monastatos was more of a comic character than probably Mozart and Schikaneder intended, but Adam Player brought it off brilliantly. Dressed in a three piece tweed suit, complete with walking cane and pipe, he was a delightfully preening, pompous and rather camp character. His attempted ravishments of Pamina were played as high comedy. Player, who includes Tamino in his repertoire, gave a beautifully sung account of the role. One of the joys of the production was the strength of the casting of the smaller roles, so that the performance had lovely ensemble feel. There was a lot of doubling of the smaller roles, Edmund Hastings and Alex Otterburn sang the Armed Men and the Priests, along with singing in the chorus, and Otterburn also sang the Speaker. The three boys were played by Phoebe-Celeste Humphreys, Suzi Saperia and Rose Martin who also sang in the chorus. The hardworking chorus numbered just 7 singers. There was a lot of delightfully detailed interaction between the characters, so that the three Ladies (Jenny Stafford, Kezia Bienek, Sarah Baillie) were both imperious and rather funny in their jostling for place. The three boys (Phoebe-Celest Humphreys, Suzi Saperia, Rose Martin) were a great delight, full of the rather silly pushing and mutual intimidation that boys everywhere indulge in. Edmund Hastings and Alex Otterburn were suitably dignified as the Priests and the Armed Men, whilst Otterburn was suitably grave and impressive as the Speaker. Caroline Kennedy was a delightful Girl Guide-ish Papagena. The opera was sung in English in a new, fluently rhyming translation by John Warrack (though I have to confess to still missing the old E.J.Dent translation). The cast's diction was excellent and virtually every word was heard. For all the slightly low budget feel to the production and the disadvantages of the terrible heat in the auditorium, the cast impressed with their consistency, the lovely feeling of ensemble, the nice detailing and great sense of energy. The directness of Brazier's production, without any gimmicks, ensured that the story was told in a clear way and she benefitted from a cast who were able to project directly. Christopher Glynn was admirably unflappable in the pit and despite the fact that sight lines cannot have been perfect, the feeling of ensemble was very strong.